One of the services we happily provide to our customers is the implementation of widely publicised MODS to the Pro Junior (and also Blues Junior) amps by FMIC. Indeed, modding current production guitar amps has turned into something of a growth industry in recent years (what does that say about the quality of commercially manufactured amps these days ??). We published a blog re MODS & Upgrades to the BJR back on April 25, 2012. All previous blogs, going back to #1, are archived & accessible on this site. Having completed quite a number of such MODS, we are in a unique position to advise customers as to the most effective strategy for their particular requirements. The Pro Junior (& BJR) amps are relatively inexpensive to begin with, so spending a few hundred $$$ bringing them up to performance standard is easy enough to justify. 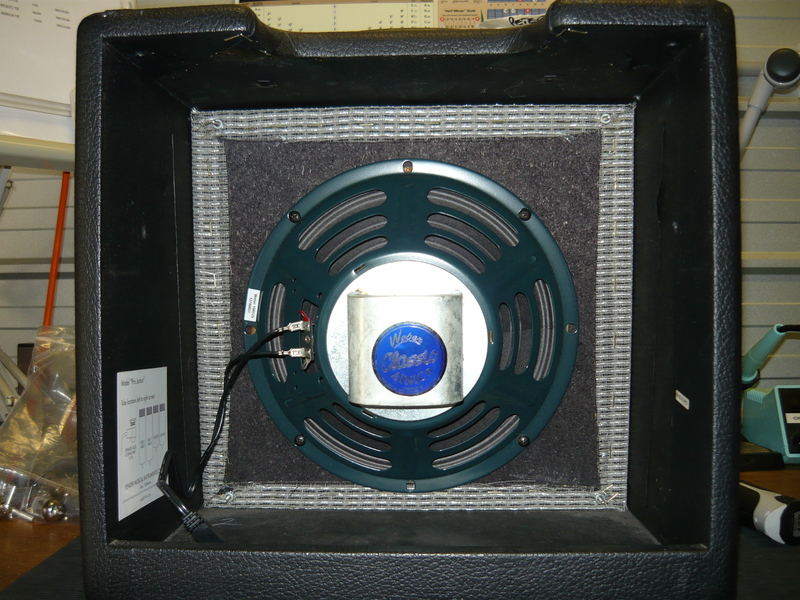 The most significant upgrade to either amp would be replacement of the stock speaker, a 10-inch driver in the case of the Pro Junior, and a 12-inch driver in the case of the BJR. The most obvious choice would be one of the Weber models, WGS are also a strong contender – we can advise you on this at the time we implement the chosen MODS, as there is a bewildering array of models to choose from. If you are a jazz stylist, we also recommend one of the Jensen NEO models, for their balanced frequency response and high power handling/late break-up. 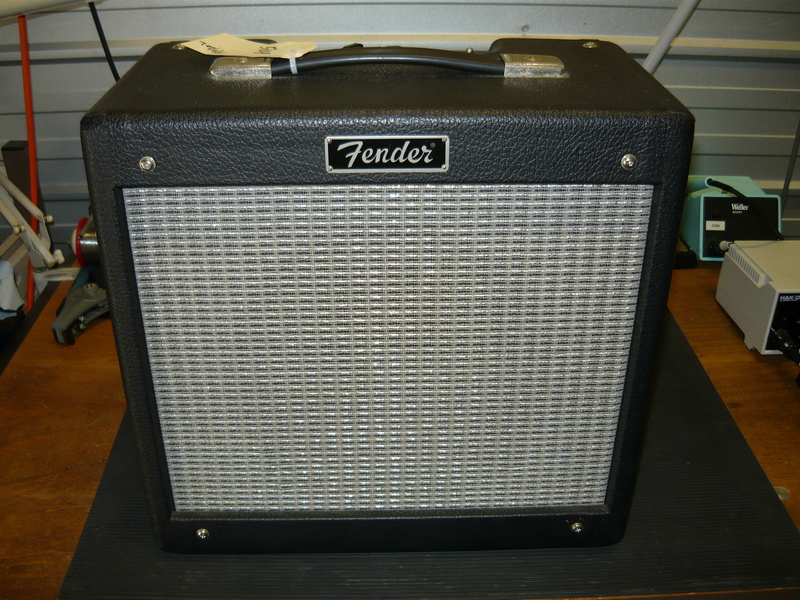 The example amp in the photos suffered from a constant hum, regardless of control settings , etc. The volume & tone pots were already scratchy, and the output valves were running hot enough to discolour the printed circuit board (p.c.b.). 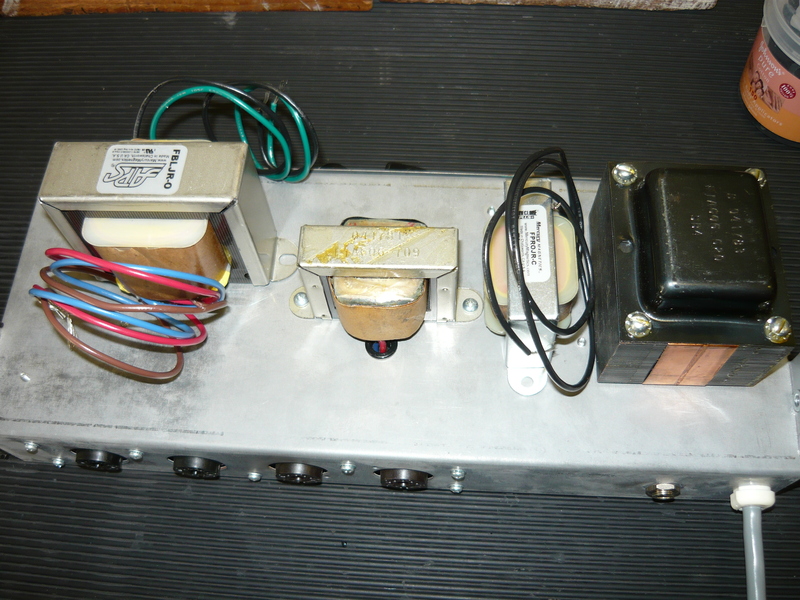 After some consultation the customer requested that we upgrade the power supply filter capacitors, implement an adjustable fixed-bias supply with a 50K 25-turn trimpot mounted to the p.c.b., install a Mercury 3H (Henry) choke in the high voltage supply, and replace the original output transformer with a Mercury upgrade unit specifically designed for these amps. 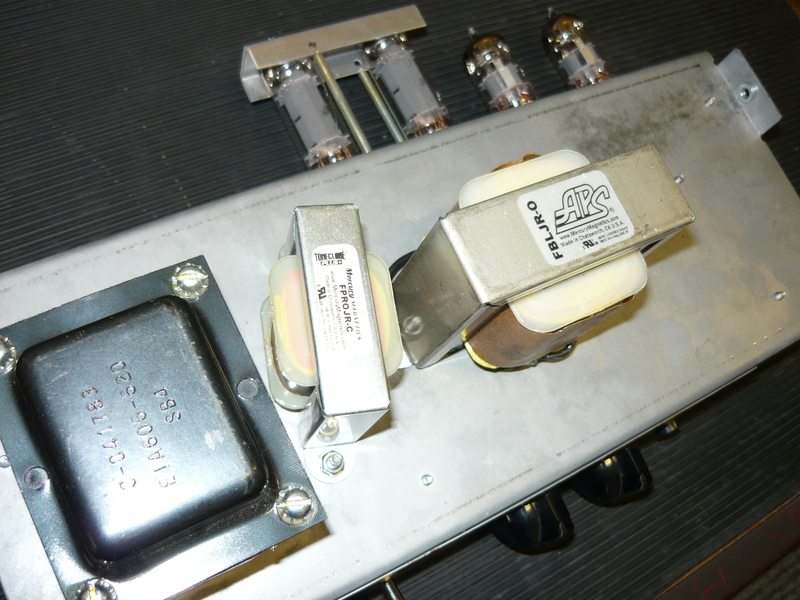 You can see in the photo to the right, the MM output transformer is significantly larger then the stock unit. We had to cut some tracks on the p.c.b. to wire the choke in series with the EL84 screen grid supply, and also to replace a fixed resistor in the bias supply with our Bourns 25-turn pot, so this would automatically void the manufacturer’s warranty where applicable. 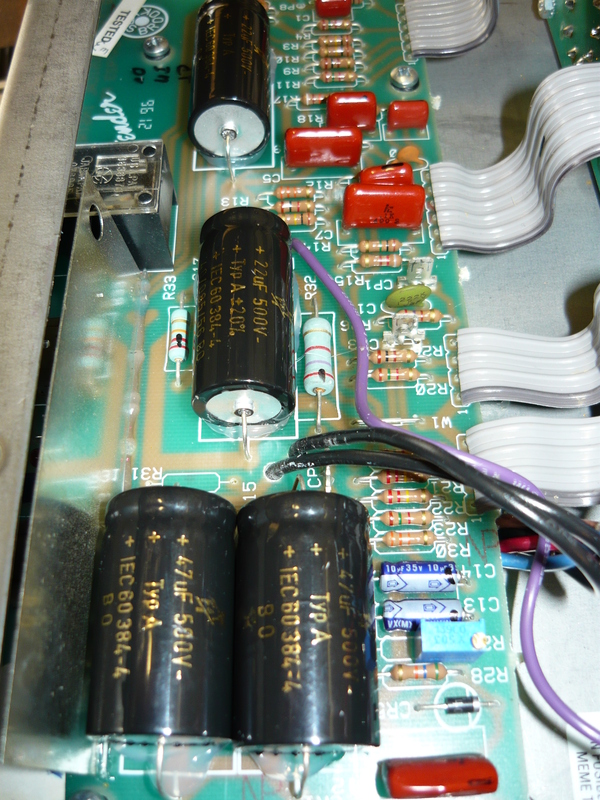 We installed four of those very fine F&T axial 500V DC electrolytic capacitors, and bedded them down on the p.c.b. in a blob of silicone for stability. We have effectively doubled the capacitance of the main reservoir capacitor, but maintained the same amount of capacitance for the preamp. While we had the amp pulled apart we took the opportunity to replace the scratchy pots and tidy up the lead dress of the interconnects, all general housekeeping type stuff that makes a difference to the final result. 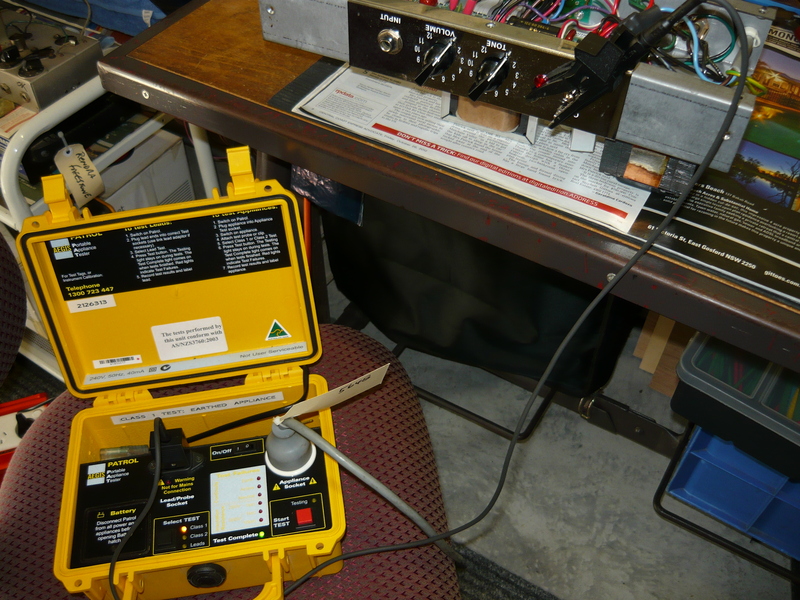 Once the amp is reassembled we carry out an electrical safety check to Workcover NSW standards. In other words, we measure the earth resistance from the 3-pin plug to any exposed metal part of the amp. We reassembled the amp and adjusted the bias volts supply for a sensible level of EL84 output valves current draw with no signal. In this example, we check the current draw by measuring the voltage drop across the primary of the output transformer. Please do not try this at home !! Always remember there are potentially lethal voltages present within a valve guitar amplifier. The power output test achieved approx 16 watts into 8 ohms, @ the onset of clipping. The previously high level of background hum & noise was now greatly reduced to an acceptable standard. 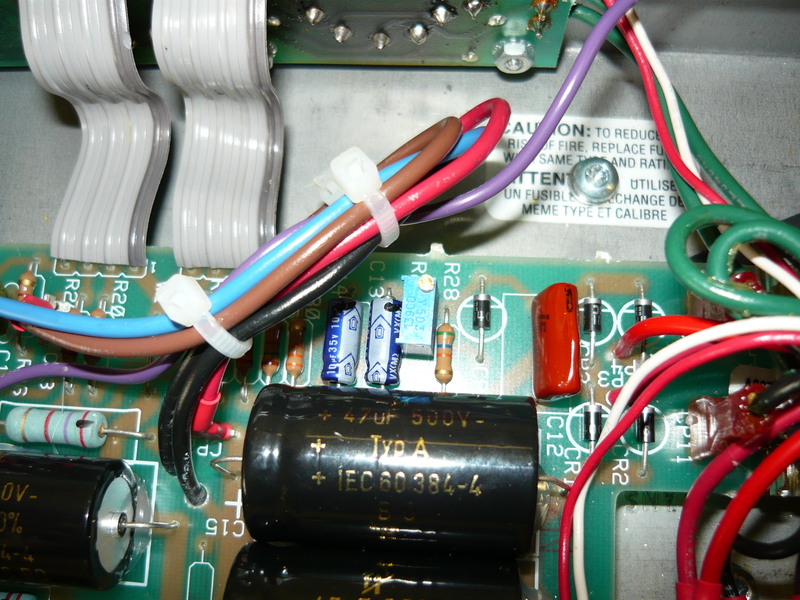 In the photo to the left, you can see where the bias trimpot has been installed, underneath the parallel-connected pair of high-voltage filter capacitors. We have taken the trouble to dress the various leads to avoid any unintentional feedback paths within the circuit. Our customer, Peter G., reported back to us that he was very please with the results. In particular, the performance of the amp was much improved when driven to “crunch” levels, as distinct from the purely “clean” performance. We attribute this to the greatly improved quality of filtering of the high voltage supply to the EL84 screen grids. This supply is now filtered by a “choke” as well as the existing resistor/capacitor arrangements. When the power amp is driven into clipping, power supply hash from an under filtered supply can enter the signal chain via the screen grids. The preamp circuit also benefits from this upgrade. The starting price for the basic MODs to the Pro Junior & BJR is around $180.00 AUD parts & labour. Obviously, upgrading hardware items such as transformers and/or speakers adds expense to the project. The list of customers of note who have had their amps modded includes James Black of the SBS TV RocKwiz Orkestra, James is one of Australia’s most in-demand musician/producer/musical-director professionals. IR. 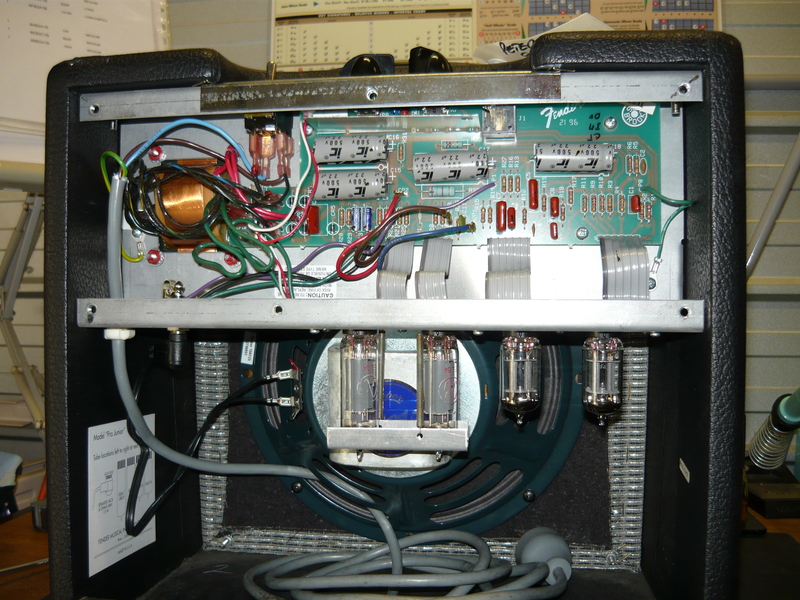 This entry was posted on March 3, 2013 at 9:36 am and is filed under Amp Repair, Amps. You can follow any responses to this entry through the RSS 2.0 feed. You can leave a response, or trackback from your own site. Im looking for a blues jr mod! I’m based in sydney! Where do i take the amp? Greg: all MOD enquiries to info@ivanrichards.com please, also 0418862034 11.00am – 7.00pm.